Panzella, its ease, simplicity and general deliciousness makes it one of those “too good to be true” kind of dishes. There is nothing quite like a meal that’s saucy and fresh, doesn’t break the bank but is still bursting with flavour and gives you the nourishment you need! 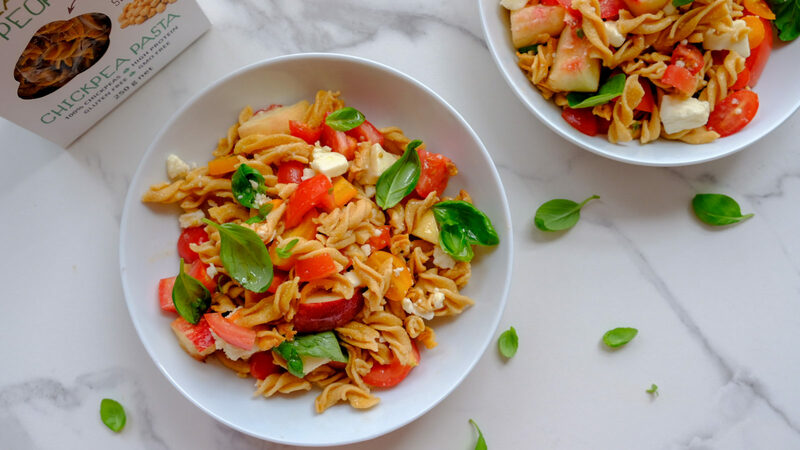 Originating from the Tuscan countryside, made from old crusty bread and sun-ripened tomatoes, this recipe is a summer essential. A dish as simple as this, accentuates flavours, so it’s important to take care in using the best ingredients. 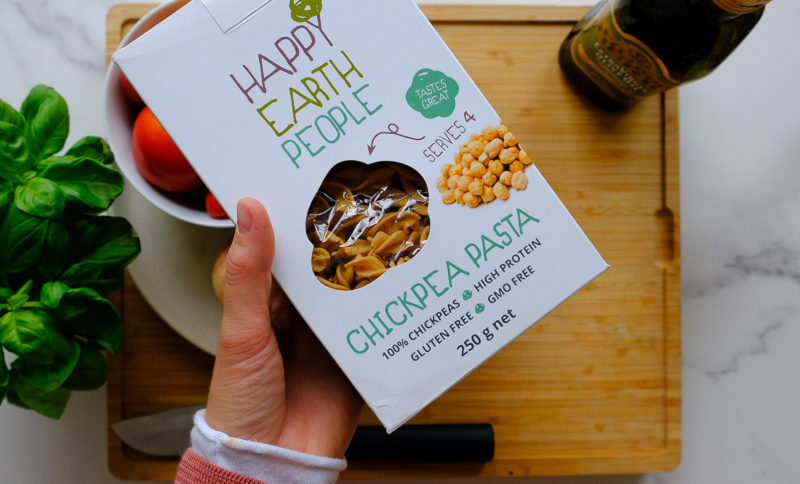 Using Happy Earth People Chickpea Pasta and simple fresh ingredients, creates the ultimate flavour combination. 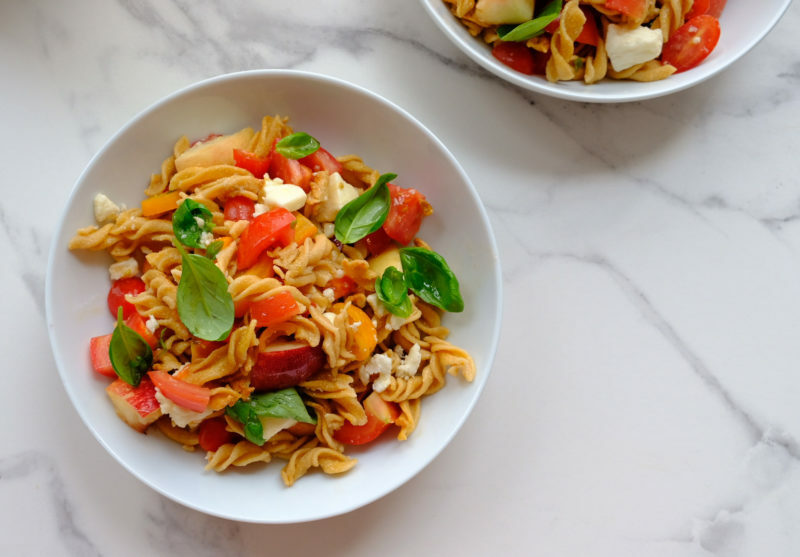 It beautifully adds earthy undertones, to this vibrant summer recipe. Plus its a source of plant-based protein and fibre. Panzella is best enjoyed in summer as a delicious way to keep cool. To make the perfect Panzella, you will need to make it ahead of time to allow the salt (which is hygroscopic) to draw moisture from the tomatoes. This creates a saucy dressing which brings depth and a subtle richness to the dish, making Panzella a perfect beach lunch or festive salad recipe. 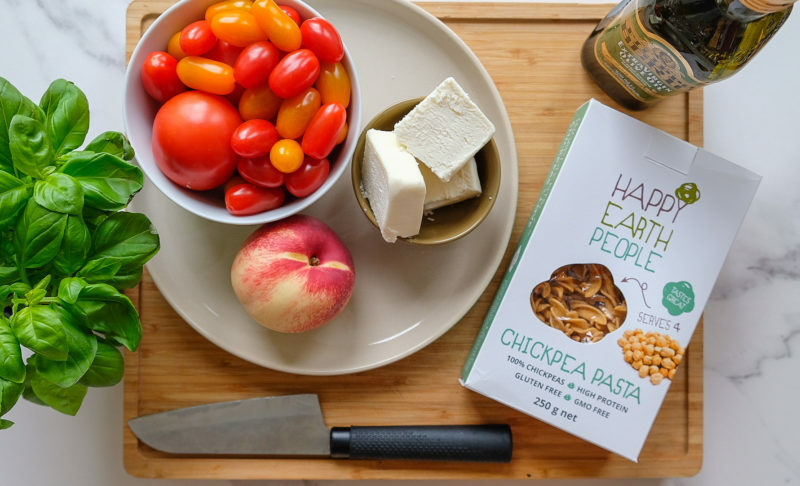 Cook the chickpea pasta in lightly salted water for 6-8 minutes or until al dente. Combine the remaining ingredients in a large bowl and toss lightly. Drain the pasta and run it under cold water to cool quickly. Once cooled, add the pasta to the tomatoes mix. Toss lightly and serve with an extra drizzle of olive oil and fresh basil or leave it the fridge to marinate and become saucier before serving. 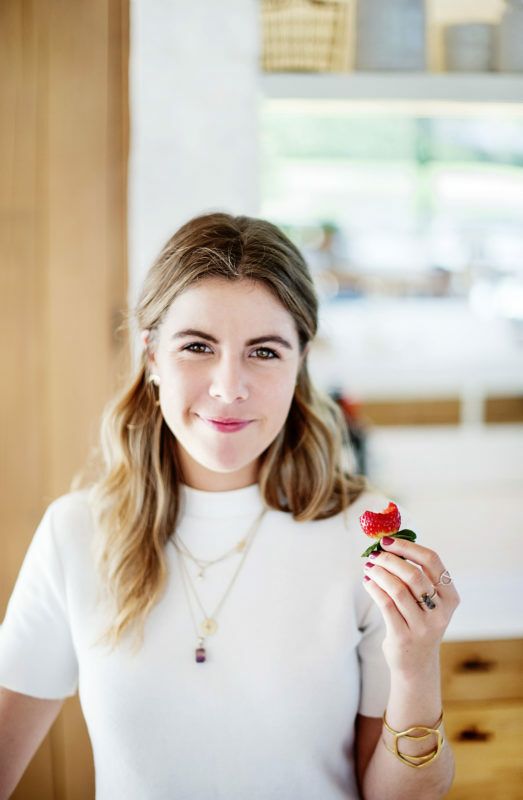 Frances is a professionally trained chef, recipe developer and blogger, who believes that life and food should be healthy as well as delicious. Her lifelong passion for sustainable alternative eating, took her to culinary school to hone her craft. She curates plant based recipes that are designed to be enjoyed by all and that are gluten-free; dairy-free and refined sugar-free. Frances believes that living well begins with eating well! There are no set rules as everyone is different. So, it is a matter of becoming mindful and listening to your body which will allow you to incorporate her recipes and become the best you. She also feels that keeping it simple means that fuelling and nourishing the body can be enjoyed by anyone – and hey, it is by no means boring or scary! Join Frances on a journey to discover how mouth-watering and rewarding a plant based lifestyle can be. Even conscious carnivores will be surprised by how easy and tasty the recipes are – let alone how great they will make you feel. You can follow her on Instagram and check out her Website to find more deliciously conscious recipes like these! This entry was posted in Nutrition, Plant-based, Recipes, Vegan, Vegetarian and tagged chickpea pasta, Delicious, Flavour combinations, Happy Earth People, High fibre, high protein, Nutrition, Plant-Based, Quick Healthy Goodness, Recipe, recipes, With love from Frances.